Oliveira, Thiago Dumont and Suprinyak, Carlos Eduardo 2018. The nature and significance of Lionel Robbins’ methodological individualism. EconomiA, Vol. 19, Issue. 1, p. 24. Masini, Fabio 2018. Decision-making processes and multilayered institutional order: Lionel Robbins’s legacy. Cambridge Journal of Economics, Vol. 42, Issue. 5, p. 1459. Falgueras-Sorauren, Ignacio 2017. A New View on Robbins's Definition of Economics: the Notions of Real and Formal Scarcity. Cuadernos de Economía, Vol. 40, Issue. 113, p. 83. Fumagalli, Roberto 2016. Economics, Psychology, and the Unity of the Decision Sciences. Philosophy of the Social Sciences, Vol. 46, Issue. 2, p. 103. Kassem, O. 2016. 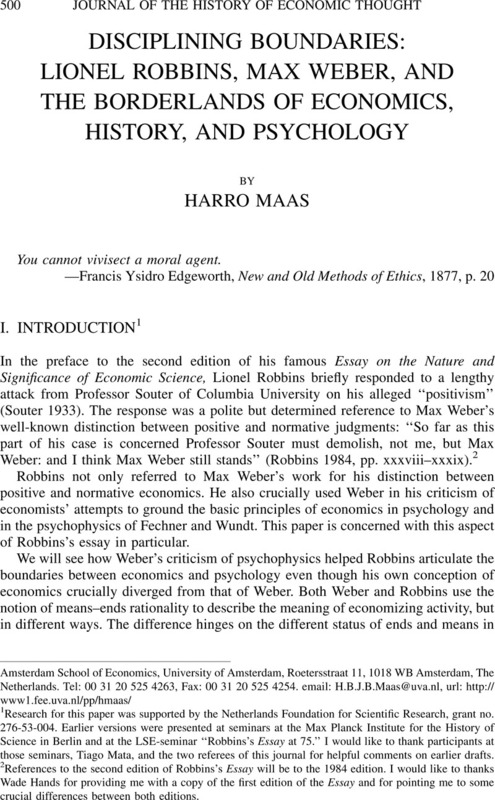 Economics, Situational Analysis, and explaining the money economy in Max Weber. Max Weber Studies, Vol. 16, Issue. 2, p. 228. Jurkovičová, Lujza and Riškova, Viktória 2012. Historical Overview of the Economic Sociology. Studia commercialia Bratislavensia, Vol. 5, Issue. 19, p. 379. Arrow, Kenneth J. 1974. The Limits of Organization. New York: Norton. Barratt, A. 1869. Physical Ethics, or, the Science of Action. Bristol: Thoemmes, 1991. Bennett, M. R. and Hacker, P. M. S.. 2002. “The Motor System in Neuroscience: A History and Analysis of Conceptual Developments.” Progress in Neurobiology 67 (1): 1–52. Brain, Robert M. 2001. “The Ontology of the Questionnaire—Max Weber on Measurement and Mass Investigation.” Studies in History and Philosophy of Science 32: 647–684. Brain, Robert M. and Norton Wise, M.. 1999. “Muscles and Engines: Indicator Diagrams and Helmholtz's Graphical Methods.” In Biagioli, M., ed., The Science Studies Reader. New York and London: Routledge, pp. 51–66. Brentano, Lujo. 1908. Die Entwickelung der Wertlehre. München: Verlag der Köninglich Bayerischen Akademie der Wissenschaften. Bruni, Luigi and Sugden, Robert. 2007. “The Road Not Taken: How Psychology Was Removed from Economics, and How It Might Be Brought Back.” The Economic Journal 117: 146–173. Chaigneau, Nicolas. 1997. Contrat et Utilité. Origines et Fondements de la Théorie de l’Échange de Francis Ysidro Edgeworth. Paris, Université de Paris I, Panthéon-Sorbonne. PhD thesis. Chang, Hasok. 2004. Inventing Temperature: Measurement and Scientific Progress. Oxford: Oxford University Press. Danziger, Kurt. 1982. “Mid-Nineteenth-Century British Psycho-Physiology: A Neglected Chapter in the History of Psychology.” In Woodward, William R. and Ash, Mitchell G., eds., The Problematic Science: Psychology in Nineteenth Century Thought. New York: Praeger, pp. 119–146. Daston, Lorraine J. 1978. “British Responses to Psycho-Physiology, 1860–1900.” Isis 69: 192–208. Daston, Lorraine J. 1982. “The Theory of Will versus the Science of Mind.” In Woodward, William R. and Ash, Mitchell G., eds., The Problematic Science: Psychology in Nineteenth Century Thought. New York: Praeger, pp. 88–115. Davidson, Donald. 1980. Essays on Actions and Events. Oxford: Clarendon Press. Debru, C. 2001. “Helmholtz and the Psychophysiology of Time.” Science in Context 14: 471–492. Edgeworth, Francis Y. 1877. New and Old Methods of Ethics, or “Physical Ethics” and “Methods of Ethics.” Oxford: James Parker. Giocoli, Nicolo. 2003. Modeling Rational Agents: From Interwar Economics to Early Modern Game Theory. Cheltenham: Edward Elgar. Goldman, Lawrence. 2003. “British Society in Nineteenth-century Britain and Germany: J. M. Ludlow, Lujo Brentano, and the Labour Question.” In Harris, Jose, ed., Civil Society in British History. Oxford: Oxford University Press, pp. 97–113. Gordin, Michael D. 2004. A Well-ordered Thing: Dmitrii Mendeleev and the Shadow of the Periodic Table. New York: Basic Books. Habermas, Jürgen. 1968. Erkenntnis und Interesse. Mit einem neuen Nachwort. Frankfurt am Main: Suhrkamp. Habermas, Jürgen. 1981. Theorie des kommunikativen Handelns, Bd. I. Frankfurt am Main: Suhrkamp. Hall, Vance M. D. 1979. “The Contribution of the Physiologist, William Benjamin Carpenter 1813–1885, to the Development of the Principles of the Correlation of Forces and the Conservation of Energy.” Medical History 23: 129–155. Hands, D. Wade. 2008. “Introspection, Revealed Preference and Neoclassical Economics: A Critical Response to Don Ross on the Robbins-Samuelson Argument Pattern.” Journal of the History of Economic Thought 30: 453–478. Hands, D. Wade. 2009. “Effective Tension in Robbins' Economic Methodology.” Economica 76 (Oct.): 831–844. Hayek, Friedrich A. 1978. “Dr. Bernard Mandeville: Lecture on a Master Mind.” In Hayek, Friedrich A., ed., New Studies in Philosophy, Politics, Economics, and the History of Ideas. London: Routledge, pp. 249–269. Heidelberger, Michael. 2004. Nature from Within. Pittsburgh: Pittsburgh University Press. Helmholtz, H. v. 1995. Science and Culture: Popular and Philosophical Essays. Chicago: University of Chicago Press. Horkheimer, Max. 1947. Eclipse of Reason. New York: Oxford University Press. Howson, S. 2004. “The Origins of Lionel Robbins's Essay on the Nature and Significance of Economic Science.” History of Political Economy 36: 413–443. Jacyna, L. S. 1983. “Immanence or Transcendence: Theories of Life and Organization in Britain, 1790–1835.” Isis 74: 311–329. Jennings, Richard. 1855. Natural Elements of Political Economy. New York: Augustus M. Kelley, 1969. Jevons, William Stanley. 1870. “On the Natural Laws of Muscular Exertion.” Nature 2: 158–60. Maas, Harro. 2005a. William Stanley Jevons and the Making of Modern Economics. Cambridge: Cambridge University Press. Maas, Harro. 2005b. “Jevons, Mill, and the Private Laboratory of the Mind.” The Manchester School 73: 620–649. Mill, John Stuart. 1843. A System of Logic, Ratiocinative and Inductive. In Robson, J. M., ed., Collected Works of John Stuart Mill, Vol. 8. Toronto: Toronto University Press, 1974. Mirowski, Philip. 1989. More Heat than Light: Economics as Social Physics, Physics as Nature's Economics. Cambridge: Cambridge University Press. Mirowski, Philip. 1994. Edgeworth on Chance, Economic Hazard, and Statistics. Lanham: Rowman & Littlefield. Newman, Peter. 2003. F.Y. Edgeworth: Mathematical Psychics and Further Papers on Political Economy. Oxford: Oxford University Press. Parsons, Talcott. 1934. “Some Reflections on “The Nature and Significance of Economics”.” The Quarterly Journal of Economics 48 (3): 511–545. Rabinbach, Anson. 1992. The Human Motor: Energy, Fatigue, and the Origins of Modernity. New York: Basic Books. Ringer, Fritz. 2002. “Max Weber on Causal Analysis, Interpretation, and Comparison.” History and Theory 41: 163–178. Robbins, Lionel C. 1932. An Essay on the Nature and Significance of Economic Science. London: Macmillan. Robbins, Lionel C. 1984. An Essay on the Nature and Significance of Economic Science. London: Macmillan. Ross, Don. 2005. Economic Theory and Cognitive Science: Microexplanation. Cambridge: MIT Press. Searle, John R. 2001. Rationality in Action. Cambridge: MIT Press. Sheehan, James J. 1966. The Career of Lujo Brentano: A Study of Liberalism and Social Reform in Imperial Germany. Chicago: University of Chicago Press. Sibum, Heinz Otto. 2005. “The Number of the Century: A History of a Scientific Fact.” In How Science Makes Sense. Amsterdam: Huizinga Institute/Praemium Erasmianum/WTMC, pp. 46–97. Souter, R. W. 1933. “‘The Nature and Significance of Economic Science’ in Recent Discussion.” Quarterly Journal of Economics 47 (May): 377–413. Weber, Max. 1975a. Roscher und Knies: The Logical Problems of Historical Economics, translated by Oakes, Guy. New York: Free Press. Weber, Max. 1975b. “Marginal Utility Theory and ‘The Fundamental Law of Psychophysics’,” translated by Schneider, Louis. Social Science Quarterly 56: 21–36. Weber, Max. 1988. Gesammelte Aufsätze zur Wissenschaftslehre. Tübingen: Mohr. Weber, Max. 1995. Zur Psychophysik der industriellen Arbeit: Schriften und Reden 1908–1912. Tübingen: Mohr. White, Michael V. 1994. “The Moment of Richard Jennings: The Production of Jevons's Marginalist Economic Agent.” In Mirowski, Philip, ed., Natural Images in Economic Thought: “Markets Read in Tooth and Claw.” Cambridge: Cambridge University Press, pp. 197–230. White, Michael. V. 2004. “In the Lobby of the Energy Hotel: W. S. Jevons’ Formulation of the Post-Classical Economic Problem.” History of Political Economy 36: 227–271. Winter, Alison. 1998. Mesmerized: Powers of Mind in Victorian Britain. Chicago: University of Chicago Press. Wise, M. Norton and Smith, Crosbie. 1989a. “Work and Waste—Political Economy and Natural Philosophy in Nineteenth Century Britain.” History of Science 27: 263–301. Wise, M. Norton and Smith, Crosbie. 1989b. “Work and Waste—Political Economy and Natural Philosophy in Nineteenth Century Britain.” History of Science 27: 391–449. Wise, M. Norton and Smith, Crosbie. 1990. “Work and Waste—Political Economy and Natural Philosophy in Nineteenth Century Britain.” History of Science 28: 221–261. Zavirovski, Milan. 2001. “Max Weber's Analysis of Marginal Utility Theory and Psychology Revisited: Latent Propositions in Economic Sociology and the Sociology of Economics.” History of Political Economy 33 (3): 437–458.